Applications are invited from the eligible candidates for admission into Post Graduate Diploma in Clinical Research (Part Time) Course for the year 2015. For details please visit NIMS website www.nims.edu.in. 1. A Candidate must submit hard copy of the application form. 2. Application form is available at: www.nims.edu.in. 3.The application form may be downloaded and filled appropriately. Please note that all the columns in the application form require to be filled in. Incomplete application forms are liable to be rejected. 4.The filled in application form should be downloaded from the website and to be submitted to the Associate Dean, Nursing and Allied Studies, Academic Section-2 (AC2) 3rd floor, Old O.P Block, Nizam’s Institute of Medical Sciences, Punjagutta, Hyderabad, 500 082, Telangana State, on or before 5.00 PM on 13-07-2015 along with a) candidate’s passport size photograph b) all the documents mentioned in the Annexure I and c) a demand draft (see para 5 below). The candidate’s signature will have to be applied in ink at the appropriate column. 5. 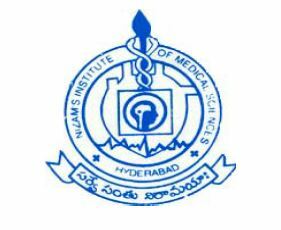 A demand draft for Rs.1,000/- (Rupees one thousand only) drawn in favour of the Director, Nizam’s Institute of Medical Sciences and dated between 20-06-2015 to 13-07-2015 or for the same amount has to be paid in cash counter of NIMS. Cash receipt will have to be submitted simultaneously along with the filled-in application. The candidate must write his/her name and the course applied for on the back side of the Bank Draft/NIMS cash receipt. Application fee is non-refundable even if the application is rejected. The training course will be class room teaching lectures, with group discussions, tutorials and hands-on exercises. The classes will be held once in a week (every satuarday between 4.00 PM to 6.00 PM). The curriculum provides comprehensive training across the entire clinical trials process, including courses from the perspective of the clinical study site as well as that of the sponsor or monitor and covers good practices, regulatory requirements and compliance, statistics and writing for clinical research. This course uses the Principles of International Conference on Harmonization (ICH) GCP Guidelines. The course runs over a period of 12 months. A minimum of 75% attendance for classroom teaching is required for appearing in the final theory examination. At the end of 12 months of classroom teaching, the final theory + viva examination will be conducted, students who secure minimum 50% marks will be declared successful. DIPLOMA CERTIFICATE WILL BE AWARDED ONLY TO THOSE CANDIDATES WHO PASSED THE FINAL THEORY + VIVA EXAMINATION. candidates till they complete their course of study and appear for the final examination. Tuition fee, cost of teaching material, library fee and examination fee.